Crown and bridge treatment can be the perfect cosmetic dental procedure for someone dealing with tooth loss. When just one tooth is missing, a lot of other problems can occur. The remaining teeth can shift, or there might be an occurence of decay, bone loss, or periodontal disease. But a crown and bridge can help stave off this domino effect of dental problems. Read on to learn just what crowns and bridges are and to find out the benefits of this treatment. A crown is a prosthetic tooth that is placed over an existing tooth. It is often called a cap, a vivid term which actually may help readers to better understand what a crown is. Crowns serve a number of functions, the first of which is to act as an anchor for the attachment of a bridge, something that is explained in detail below. 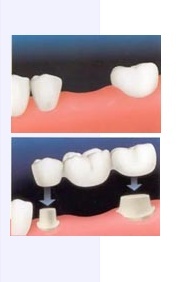 Crowns are also commonly used as a support when a tooth is at a point that it can no longer accept a filling. Broken or fractured teeth can also benefit from a crown, as it would act as protection for the tooth structure. In call cases, fitting a crown over your natural tooth can improve, support, and strengthen its appearance. A bridge is a dental piece that fills in gaps by being anchored to the surrounding natural teeth. These neighboring teeth are fit with crowns to hold the replacement teeth down. Crowns and bridges are made up of quality material like semiprecious or precious metals, porcelain or often of a combination of the two fused together. You and your doctor can discuss the best option for you, considering both appearance and practicality. Understanding Why You Need Crown and Bridge Treatment. A lot of more serious dental problems can arise from the loss of a tooth. No matter how the damage originally occured, be it decay, an accident, or gum disease, it can spiral into other problems. For example, the new space can change the fit of teeth and functionality of the jaw, causing shifting of remaining teeth. Gum disease or further bone damage can occur from the shifting of the gap's opposing remaining tooth. Changes in chewing patterns may cause further tooth loss if the original missing one is not replaced. Understanding the Benefits of Crown and Bridge Treatment.